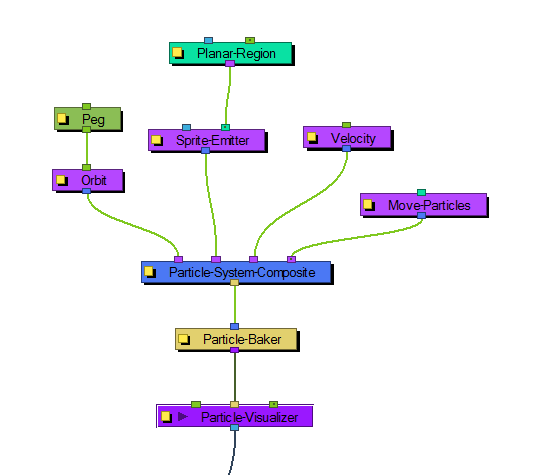 The Orbit module allows you to define an axis that the particles will be attracted to and orbit around. 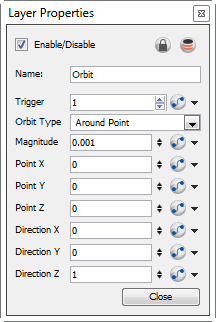 Plug a peg layer into the orbit to move the position of the orbit without adjusting the parameters in the Layer Properties. Fine-tuning the Orbit module can take a little finesse, because the orbit takes into account the velocity of the particles, and uses this to determine whether the particle will orbit around the axis, whether it will be influenced but eventually escape, or whether it will hardly be influenced at all. This is just like how Gravity between astral bodies works in space. You will also want to make sure that your initial velocity is varied, so use an interpolated speed and set two different values, that way there will be a spread between them. If not, then you will get the effects as shown above. Also, you should use the peg layer to move the position of the Orbit module around until you find the right spot to get the look you're trying to achieve. It also helps to set some Pre-Roll frames on your Baker to get things ramped-up before you start to manipulate the position of the Orbit module. Use the Orbit Module's Layer Properties panel to adjust the effect's parameters. • Orbit Type: Select the type of Orbit you'd like to use from the drop-down list. For most scenarios, like asteroids orbiting a planet, then a point will suffice for this. If you would like to rotate around an axis instead, then choose between the X, Y, Z axes or set up your own custom axis. • Magnitude: Adjust the amount that the acceleration of each particle will be adjusted. The higher this value, the more the particle will accelerate towards the orbit. A magnitude of 0.001 is a good number to use for this. 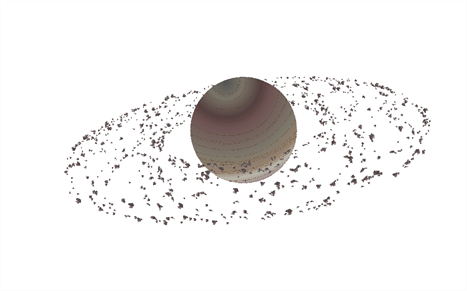 When the magnitude is set too high, the particles will simply fly out into space. • Point X: Defines the X position of the centre of the Orbit. You may also leave this at 0 and use a peg to move the position of the Orbit module. • Point Y: Defines the Y position of the centre of the Orbit. • Point Z: Defines the Z position of the centre of the Orbit. • Direction X: Defines the X component of the axis of rotation for the orbit. This is only taken into account if you choose to set up a custom axis. If this is set to 1, and Y and Z are set to 0, then the axis will be going in the same direction as the X axis. If the X component is set to 1, and the Y component is also set to 1, then the axis will be at a 45 degree angle between the two. • Direction Y: Defines the Y component of the axis of rotation for the orbit. • Direction Z: Defines the Z component of the axis of rotation for the orbit.